Antelope Audio has an enduring reputation for the design and manufacture of high quality audio interfaces, bringing the analogue and digital audio worlds together in perfect harmony. Back to the present and Antelope Audio have launched a new high quality audio interface called the Discrete 8 which takes them headlong into the world of microphone and mic amp modelling for the first time. The 1RU x 19” rack unit offers a massive 26 inputs and 32 outputs. 8 analogue inputs channels, all with hi-end discrete mic amps, with 6 mic/line inputs (on rear mounted combo sockets) and the other two mic/Hi-Z inputs on front panel mounted combos allowing for DI of instruments. All eight mic amps can be transformed using Antelope Audio’s FPGA engine to model a variety of classic mic amps designs with no latency. 8 line level analogue outputs are also provided, bundled into a single DB25 connector so you will need a split out cable to connect to your destinations or more probably to your jackfield. In addition you get a stereo monitor output, two REAMP outputs and a pair of stereo headphone outputs, all on ¼” jacks. There is a good complement of digital I/O provided, with 2 ADATs (so up to 16 channels depending on sampling frequency) and a pair of S/PDIF connectors. The mic amps have a very good noise performance of -128 dBu (A-weighted) and a quoted dynamic range of 121dB. THD is also quoted as -106db which equates to a very low 0.0005%. Maximum input handling is good at +18dBu and the gain range is 65dB, probably well matched when used with Antelope Audio’s two new microphone models, which we’ll come on to in a while. The A/Ds are spec’d separately, with the same dynamic range of 121dB and THD +Noise at -112dB. Line outputs are spec’d at a maximum output of +20dBu which is adequate but on the low side for a professional interface and the D/As achieve a good dynamic range of 121dB with THD + Noise down at -100dB. The main monitor output D/As are even higher spec’d with a dynamic range of 124 dB and a quoted THD + N figure of -101 dB. As you would expect from an Antelope Audio interface, clocking facilities are excellent with one word clock input and three word clock outputs, all on BNCs and covering the full sampling rate options offered which are 32, 44.1, 48, 88.2, 96, 176.4, 192kHz. The clocking system is Antelope Audio’s 4th Generation Acoustically Focused Clocking with 64-bit DDS (direct digital synthesizer), which includes Antelope Audio’s world-renowned jitter management algorithm. The main streaming audio/control interface is offered both via USB2.0 which can stream up to 480 Mbs, so up to 24 channels of I/O at 192kHz and via Thunderbolt which takes the streaming capacity up to 32 channels I/O presumably not actually limited by the Thunderbolt specification which can handle a lot more. Finishing off round the back, there is a programmable ¼” footswitch socket (typically used to operate the talkback mic and an 18 volt dc input socket for the external mains adapter. – and finally two headphone outputs each with their own level control. Pause for breath … that’s a lot of facilities in a 1RU box! This is an interface primarily designed for recording. As well as signal capture you can output up to four independent monitor mixes, so each band member could have their own monitor mix. 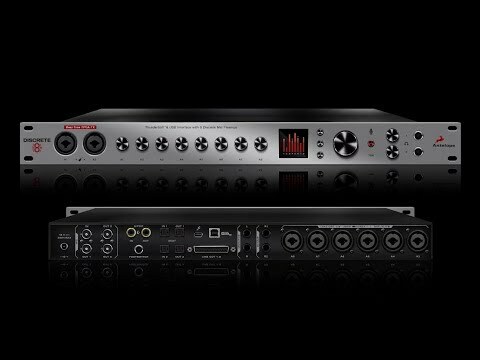 Antelope Audio are also offering a half rack version with 4 mic channels called … Discrete 4! Antelope Audio have been offering FPGA based effects modelling for a few years now in their audio interface range. FPGA has the huge advantage of close to zero latency so you have the option to include real time effects for ‘live’ feeds back to artists so they can perform with a fully effect laden foldback mix. This is a great way to aid good performances. Already in the catalogue is a big range of classic valve and FET compressors, 19 modelled EQs with more to come, a number of amp/speaker emulations, and AuraVerb, the company’s first 64-bit reverb featuring eight user control variables and 24 Custom Presets designed by Five-Time GRAMMY Award Winner Brian Vibberts. Now Antelope Audio has taken FPGA based modelling even further with mic and mic amp modelling being offered with the Discrete 8. Turning to microphone modelling, the FPGA based Accusonic 3D modelling engine enables the new Edge and Verge microphones to recreate the sound of a whole range of vintage mics, giving you complete control over proximity effect, off-axis response and even allowing you to change polar patterns during or after recording. Remember this is all possible in real time with no delay so the artist can hear the end result as they are performing. Mic amps can also be passed through the Accusonic 3D modelling engine to provide, at present, 10 classic preamps so think tubes, transformers and FET-based circuitry. It’s all possible and all in real time without any latency or comb filtering issues. The recording engineering has the choice to record with or without Accusonic modelling, so if preferred, you add preamp modelling during mixdown. Accussonic modelled will work with any microphone but it makes a lot of sense to consider purchasing Antelope Audio’s new Edge and Verge modelling microphones which were both design to match the Discrete 8 preamps and the Accusonic modelling. We’ll take a look at the two new mics in detail another time but in brief, the Edge is a large diaphragm condenser with dual edge-terminated capsules capable of multiple polar patterns. The Verge is a small diaphragm back electret condenser with high SPL handling so a very versatile instrument and drum mic. Both mics are powered via 48V DC Phantom Power supplied from the Discrete 8 Interface. With such a lot of facilities available, Antelope Audio have thoughtfully provided a range of user control options. A new ‘ConnectAFX’ plug-in allows all of the unit’s settings to be controlled inside your usual DAW. In addition a downloading remote App has been created for iOS and Android devices so that the artists could control their own monitor mixes if desired. The ConnectAFX plug-in allows presets to be stored and shared with other Discrete 8 users, so this opens up some big possibilities for top producers to create and share their own favourite processed signal chains. Extending the FPGA based platform to include mic and mic preamp modelling has given Antelope Audio a pretty unique offering in the marketplace today. Yes, most pro audio interfaces provide low latency monitor mixing and some channel processing facilities but I can’t think of anything else on the market offering this end to end range of real time effects. I’ll update this review as more information becomes available from Antelope Audio and I can’t wait to hear some of the modeled mic and mic preamps in action. Meanwhile, here’s a short intro video to wet the appetite.